February 2008 marks the 30th anniversary of the Blizzard Of ‘78. Arguably New England’s “Storm of the Century,” the Blizzard of ’78 dumped 30-plus inches of snow on the area, paralyzing Boston and surrounding suburbs for a week. Snow fell for a full 33 hours and, at times, at a rate of 4 inches per hour. Even worse were the hurricane force winds (up 86 mph with gusts up to 111 mph) and high tides that devastated the New England coastline. Storm recovery cost about $520,000,000 (about $1.7 billion in 2008 dollars). More than 3,000 cars were found abandoned on the highways during the clean up, which took about a week to complete. My memory of the storm was almost becoming one of those who had to abandon their cars on route 93. A friend of mine had a job somewhere down around Route 128 in Woburn, MA. On February 6th, with the storm cranking along, he decides to work some overtime. By the time he leaves he is going nowhere in his Firebird so he gives me a call for a ride. Well my Father was not about to let me ride off into the storm so he volunteers to drive me down and pick him up. Talk about a long, white-knuckled ride. We made it, but just barely. Route 93 was nothing but a couple of ruts by the time we got back to Salem, NH sometime around midnight. 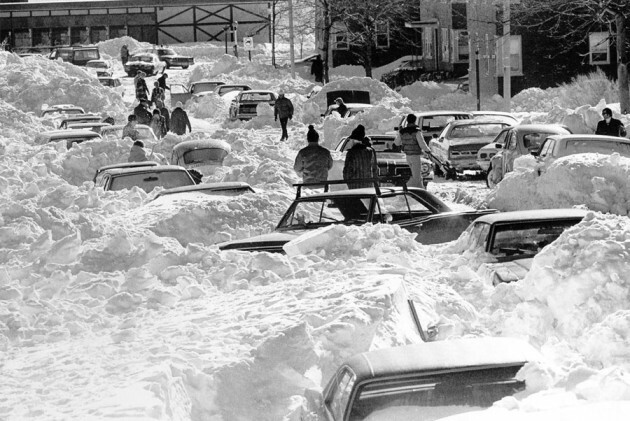 Have any memories of the “Blizzard of ‘78” ? Let us know.